It is not yet 8:00 in the morning, and already the bullhorns are active. Organizers are chanting out instructions just out of sight, and music is blaring from loudspeakers somewhere in the distance. I notice that there is absolutely no traffic on the streets. Strange for Panepistemiou – normally one of the busiest thoroughfares in central Athens. Our hotel is a few blocks from Syntagma Square, located in front of the Greek Parliament. A pause descends. The sudden quiet hangs uneasily over everything. Welcome to another day of protests in Athens. The austerity measures proposed to curb a crushing debt crisis will fall hardest on those who can least afford it. They focus their ire on the politicians – hence the reason for yet another march to the Square. This one, at least, is peaceful, unlike some others late last week. Then, frustration flowed into anger, and anger into bloodshed. Today, however, one can get around in this eerie neverland between normalcy and chaos, if only on foot. Decisions made over the weekend – primarily the German decision to support another E.U. bailout – will buy some time. But the debt problem is getting worse. Already, the almost-unanimous consensus among analysts is that the current remedies are insufficient. The mountain of debt and another accelerating constriction in credit are once again raising red flags in Rome, Dublin, and Lisbon. And that means contagion renews as a concern for all of the Eurozone. Among the unfortunately tagged “PIGS” – Portugal, Italy (or Ireland, depending on who you talk to), Greece, and Spain – the major concern remains with the last country. Spain has a far larger European-wide economic impact than Greece. Should it go, the euro does not survive. Some in Brussels are talking about a worst-case scenario, calling for the sacrifice of Greek stability for years into the future to save Spain. That alternative is not a serious proposal at this stage. Nonetheless, it is hardly lost on the crowd. “This is Athens, not Madrid,” is one of the chants now arising from the protest leaders walking behind their bullhorns. I will be here for another week. There will be an almost certain collapse of a government and intensifying opposition to the remedies dictated by the E.U. and the International Monetary Fund (IMF), with no assurance that the result will be any better. One of the consequences of this ongoing crisis, however, already has a direct bearing upon the price of oil. In the last several years, crude has assumed a dual identity. It remains a commodity produced, refined, and used as a fuel (the “wet barrel”). But it is also a financial asset in its own right (the “paper barrel” futures contract). It is tradable, fungible, and, most importantly, a store of value. As the debt problem worsens here in Greece, and cracks expand elsewhere in the currency fabric of a union progressively under siege, transfers of liquidity are expected in a feverish pursuit of risk avoidance. Which leads us back to crude oil. ce of Brent, while the price of West Texas Intermediate (WTI) in New York moves down, involves what each benchmark represents. Some of that results from huge surpluses piling up in Cushing, Oklahoma (where pipelines intersect and the NYMEX rate for WTI is determined). Yet the primary reason emerging over the last year for the reversal in the WTI-Brent spread is a more fundamental one: Brent now reflects the global oil market much better than WTI does. Regions trading crude more sour (with higher sulfur content) than the benchmarks price it at a discount to Brent, rather than to WTI. Being a better blend actually works against WTI. In this environment, a Europe facing cyclical bouts with inflation and deflation scares becomes a ready-made market for replacing control over crude futures for other assets under pressure. After all, the trade in oil remains dollar-denominated, and the Eurozone has had considerable experience in parlaying a weaker greenback (needed to purchase the raw material) with the euro-denominated base of selling retail oil products. That has resulted in oil becoming the attractive new asset investment for those in Europe seeking to spread out risk. And the longer the debt crisis intensifies, the greater that attraction. First, aside from the occasional vacillation, the volatility-generating spread between Brent and WTI will remain at high levels, with a decisive nod to Brent on the upside. Second, the inflationary pressures building in Europe with each new bailout will only make that spread more attractive. The former “seigniorage” advantage to dollars from oil trade (petrodollars remaining abroad, not repatriating, and, thereby, not providing inflationary pressure in the U.S.) will slowly give way to Europe beginning to export its inflation to the states. That's because Brent will become the lead partner in redressing its spread with WTI. In other words, as that spread narrows, WTI will come up in price; Brent will not move down. Any way you look at it, the Brent premium will continue to serve as an attractive magnet for the repository of asset value. Back in Athens, even after a 40-year absence since my time living here as a student, I am finding my Greek is coming back. That may be a mixed blessing. Going to dinner tonight, I started reading the graffiti spray-painted on buildings a few steps from our hotel entrance. One caught my eye. 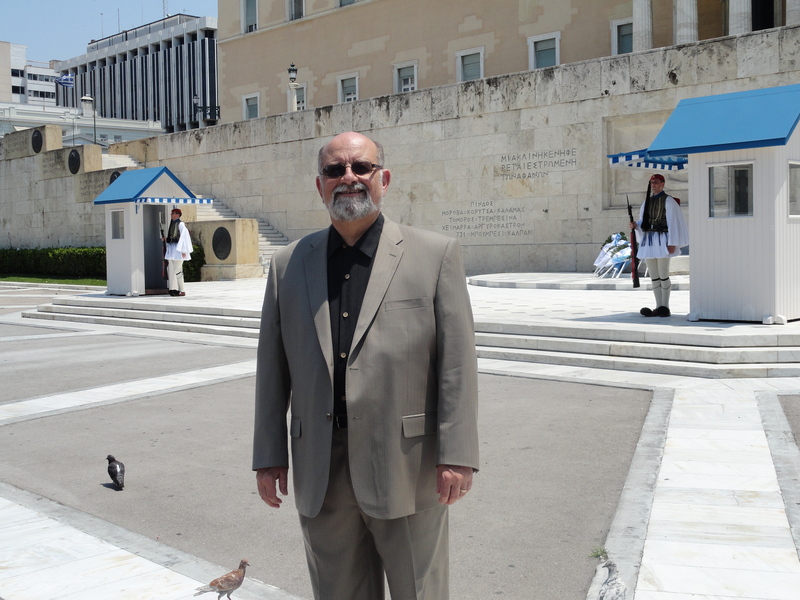 Behind me is the Parliament Building in Athens. It's right across the street from Syntagma Square, a magnet for protesters, where a number of activist groups and associations have now established a “permanent” presence. This photo was taken yesterday. Sundays are the safest time to go down there (and take photos), since in this Orthodox country there are no demonstrations on a Sunday (unless matters are really about to explode). But on Saturday, this place was swarming, with almost 1,000 soldiers and police and as many as 100,000 protestors in the Square below and the street above. I am curious. Many commentators have talked about $120 oil yet oil is once again in the 90s. Is there a USO type play for Brent? Is now a good time to get back into oil and, if so, what is the best way? Kent: Obama hates natural gas and wants green energy which is neither practical nor efficient. EPA hates the fracturing techniques being used by American companies to extract shale oil and gas. With all of thses things working against the industry, what makes you think it will be sucessful in the US (at lease while Obama is still around) and until the EPA goes back to its traditional role of do nothing, half retired government workers. Every disaster that has befallen us, has either been the direct fault or added by the stupidity of Government. This will be no different. i am watching russian TV and Putin told that next year oil price will be around 90.How it might be? Because incurrent election cycle for inside market would be more favorable to have lower end prices? (2012 election year for Russia). First, take all of the free loading socilist-communists and put them into a rendering vat. Render them into grease,something that is of use! Then chase down all of the politicans who catered to their demands,put them in a chain gang,and parade them around the world while their handlers use whips on them so all of the politicans and voters of other countries can see what the end result of unrestrained greed and entitlementis and can be! Why do CQP and LNG trade so differently? They’re the same company, aren’t they. Is there a play for oil in USO or some other ETF…do we see a support for WTI at $92 here? What happens if Greece defaults, and when do you think it will happen? Also I think a case could be made for a law that says anyone who ever voted for anything connected to the Obama administration are certifiably unqualified to ever vote in any election ever. Including dog catchers. PS there’s got be a joke in there somewhere….about Greece providing the grease for the gristmill. Come to think of it all of Europe has plenty of raw material for the gristmill. Just think what a wonderful new industry that would provide. I’d be glad to start exporting the our refuse the Democrats have created here. Loaning more Euros to Greece is just postponing the inevitable. They will never be able to pay back the debts they already owe, much less additional debts. Greece must drop out or be kicked out of the Eurozone. Then they can sharply devalue their own currency which will make their exports more competitive. Of course they will have to learn to live without imports they will no longer be able to afford. Maybe then ordinary Greeks will learn their only recourse is hard work and not sitting around in cafes drinking ouzo, and also, maybe then tourists will again want to visit. I’m lost on the conclusion … is it better to buy Brent or WTI (via ETNs) ? Please stay safe we all need you. I am sure that you are bombarded with these questions. What happens to oil and our oil stocks now that the IEA has opened up the strategic reserves. Will it have a long term effect and will our stocks be OK? It would seem they are acting for political purposes, but it may be they know of a big supply problem. Thanks for your question, Jerry. See today’s Oil & Energy Investor for Kent’s response. What is all the fuss about 60 million barrels. The world uses about 85 million a day!! Of this the US is the largest consumer.Anything to make news. Before Obama’s term is over, we will probably replace that 60 million barrels from the SPR at a price north of $120. First, you relate to the oil crises but you don t see the whole picture. The gold and precious metals is eventuly going up too. Why???? because more people are investing in these commodities…. What is mis understood is there is more precious metal in the world than oil.. 85 % in soft precious metals which cannot be seen and to 15 % in a metallic form that can be seen… I work as a independant chemist and found this to be very true. Research has proven this to me. Also, coming from the oil industry into the mining industry our oil reserves in the United States are here,the oil companies know by capping off old wells because of cost compared to costs overseas cost to produce. I am sure that you are bombarded with these questions. What happens to oil and our oil stocks now that the IE A has opened up the strategic reserves. Will it have a long term effect and will our stocks be OK? It would seem they are acting for political purposes, but it may be they know of a big supply problem. Kent: For some reason I have not been getting your email updates and would like to be added back to your readers. Can you do that for me?? ?